Figure 1. Acid erosion of tooth enamel in a bulimic patient. Tooth enamel is over 90% mineral, which dissolves in acid. Any acid can dissolve tooth enamel, including those found in food and drink. Among the common dietary acids are citric acid (found at especially destructive pH in lemons), phosphoric acid (a common ingredient in soft drinks) and ascetic acid (found in vinegar). The teeth in Figure 1 exhibit (acid) chemical erosion secondary to the eating disorder, bulimia. The lingual surfaces (facing the inside of the mouth) are commonly more eroded than the facial surfaces (shown) in bulimic patients. Acid eroded teeth are easy to spot. The enamel appears uniformly thin and transparent, even on areas that do not wear against an opposing tooth, and once-sharp edges are uniformly rounded. Normal surface convexity may become flattened or concave (see arrow), and tooth decay (caries) may or may not be present, depending on the patient’s oral hygiene. Another non-bacterial source of acid that can be destructive to the teeth is stomach acid (hydrochloric acid). Bulimic patients and those with gastro-esophageal reflux disorder (GERD) are at risk for the destruction of their teeth from their own stomach acid. 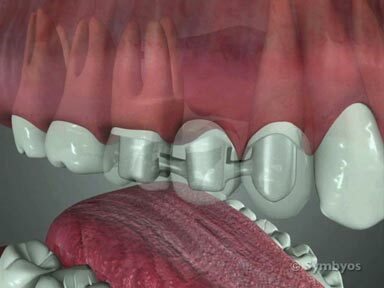 Edentulism (complete tooth loss) can result if the cause is not brought under control. Figure 2. Acid erosion caused by GERD.This patient’s GERD condition was especially active while the patient was sleeping, and was caused by presence of a sliding hiatal hernia. The white area on the affected six-year molar is an oversized sealant. Tooth restorations (which are generally acid-resistant) are commonly elevated above the surface contours of the acid-eroded teeth. The lower six-year molars of the patient in Figure 2 have been eroded by stomach acid. This patient suffered from chronic GERD. GERD can predispose patients to esophageal cancer, and when suspected should be diagnosed and treated by a physician. Dentists can observe this pattern and make an appropriate referral to a gastroenterologist physician for evaluation. Note that The 12-year molars are not as involved, for two reasons. First, they had been in the mouth for less than two years when the condition was diagnosed; second, they have been protected from stomach acid by the tongue, which falls back in the mouth when the patient is sleeping. The term “idiopathic erosion” is used when specific causes for the observed erosion cannot be identified. Such cases can be frustrating for the dentist and the patient, because the success of treatment is difficult to predict. How does the dentist diagnose Chemical Erosion? Patient history is very important. Tooth enamel is extremely durable, and is normally thick enough to mask the underlying dentin. Typically surface features such as cusps and relatively sharp ridges are present in the teeth. These features are typically missing or reduced when acid erosion is present. The convex surface contours may become concave, and the thin, transparent enamel that remains allows the underlying dentin to show through. This makes the tooth appear yellow-brown. There is often an absence of flattened wear planes (facets) on opposing surfaces, because the acid erodes them away. The surface features of the tooth resemble melted ice. How is Chemical Erosion treated? 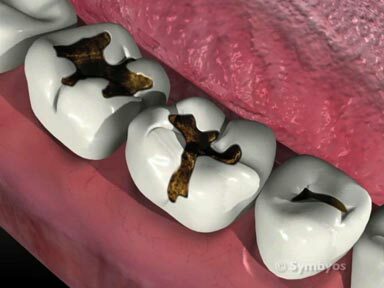 If acid erosion is suspected, early intervention can prevent the need for expensive dental treatment. Photographs and dental X-rays (radiographs) taken over a period of time can help to determine whether the patient has an ongoing problem that is causing acid erosion, or whether the damage occurred at some time in the past. Success of dental treatment depends on control of the causative factors. Regardless of the severity of damage to the teeth, the patient should be evaluated by an appropriately trained medical professional if active bulimia (an eating disorder) or GERD are suspected. If the damage is due to improper nutrition, the patient may be counseled on the damaging effects of chronic exposure to acids on the teeth. Patients who have a habit of sucking on lemons or other acidic foods; or eating lemon salts should be informed of the destruction that can be done to their teeth, and encouraged to quit the habit. Patients who frequently drink soda or other drinks containing acids and sugars should be encouraged to read labels and reduce their consumption of these beverages. 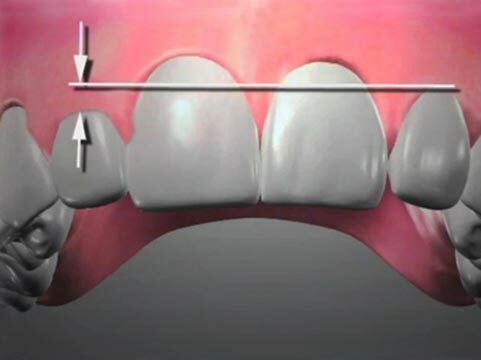 Treatment of affected teeth depends on the severity of the damage once the cause is controlled. Treatment may include any combination of fillings, veneers, onlays and/or crowns. Repeated exposure to stomach acid can also cause dental restorations to fail, as the teeth can dissolve around them.